im not the type to leave bad reviews, this is the first one I have EVER written in my life! Thefront office staff is horrible! rude and incompetent! I schedule my appointment trough zocdoc, when I showed up there wads no record of my appointment and I had to reschedule until the next day at 10:30. Which I was okay with, I understand sometimes mistakes can happen. I showed up a half hour before my scheduled time and completed paper work. The Dr. didn't even show up to her office until close to 12 pm. and I had to be to work at 1pm! and once she arrived the literally took her time as if my time was not important. I ended up be a hour and a half late to work just for a 10 minute visit with the doctor. every concern I expressed to her she brushed and as if she wasn't listening! 2 weeks goes by and I request a copy my labs and they tell me they cant find my chart. I called again after receiving NO follow up phone call requesting them again. and again, they cant find my chart! and hanging up when asked why is was missing for almost a month . I would neverrrrrrrrrrr suggest anybody schedules here. im not the type to leave bad reviews, this is the first one I have EVER written in my life! The front office staff is horrible! rude and incompetent! I schedulemy appointment trough zocdoc, when I showed up there wads no record of my appointment and I had to reschedule until the next day at 10:30. Which I was okay with, I understand sometimes mistakes can happen. I showed up a half hour before my scheduled time and completed paper work. The Dr. didn't even show up to her office until close to 12 pm. and I had to be to work at 1pm! and once she arrived the literally took her time as if my time was not important. I ended up be a hour and a half late to work just for a 10 minute visit with the doctor. every concern I expressed to her she brushed and as if she wasn't listening! 2 weeks goes by and I request a copy my labs and they tell me they cant find my chart. I called again after receiving NO follow up phone call requesting them again. and again, they cant find my chart! and hanging up when asked why is was missing for almost a month . I would neverrrrrrrrrrr suggest anybody schedules here. Dr Jain was very nice. I really liked her. I did not like her front desk person. Rude. Abrupt and surly.Lady who did my vitals was also very sweet. 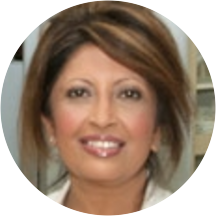 Dr. Meenakshi Jain has been a Board Certified and practicing OB/GYN for over 25 years in the St. Petersburg area. She provides the highest standard of care and is very proficient in the most recent medical and technological advances. She is board certified in OB/GYN and is on active staff in many local area hospitals. She has been using different types of lasers in her gynecological practice over the last 25 years. Her areas of expertise are minimally invasive gynecological surgery, urogynecology, management of chronic pelvic pain, incontinence and cosmetogynecology. She is very excited to provide a service to the community where her patients have an opportunity not only to feel good but also look good. Very kind and explained my concerns and her own in detail. Was worth the wait. I feel confident in her recommendations and they should work nicely for me. Great staff, horrible wait time. I love Dr Jain and I think that for people who need her specialized services should see her but the waiting time is not worth it for a routine pap. My appointment was at 11:15 and Dr. Jain did not see me until 2:50, i had a class that started at 2, and I was forced to miss it because of her unprofessionalism. She also did not give me the genericprescription I needed and I was forced to pay a pricy copay for my medication. I will not be returning to her office.